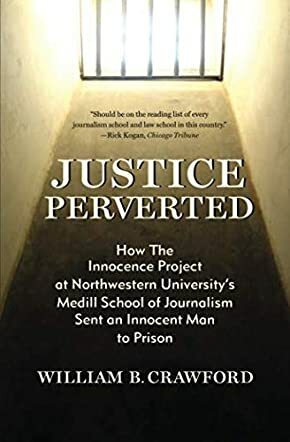 Justice Perverted: How The Innocence Project at Northwestern University's Medill School of Journalism Sent an Innocent Man to Prison by William B Crawford is a true story. Anthony Porter was convicted of a brutal double murder in 1983. The victims were Marilyn Green and Jerry Hillard, both shot at point blank range several times while sitting in the bleachers near the swimming pool at Washington Park. Fifteen years later, in 1998, just 50 hours from the time of his execution, Antony was granted a stay, pending the results of a hearing on his mental competency. It was at this point that David Protess, a professor of Journalism, and his group of Northwestern University Innocence Project students decided to get involved with Porter’s cause, effecting his subsequent release from prison. Shortly after this, a Milwaukee resident by the name of Alstory Simon was convicted of the murders. Unfortunately, that is not where the story ended. Simon has since been released and cleared of all charges, and is now pursuing legal action against the Innocence Project and David Protess for more than $40 million. This is the story of how Simon came to take Porter’s place in prison. Justice Perverted by William B Crawford is a real eye opener. We all know that miscarriages of justice take place on a far too regular basis, but few of us are invited to hear the stories behind them. Thanks to William Crawford, we have been given a rare insight into how the wheels of justice turn, be they forward or backwards. Being a true crime aficionado, I was thoroughly hooked by this story. The footwork and research that has gone into it is phenomenal and it shows as the story unfolds. Crawford has an engaging writing style, drawing a reader in by the intensity of the story and the drip feed of details, written in such a way that you can’t put the book down until it’s read. The story does make you question these so-called Innocence Projects, what drives them, and how they draw their conclusions. It also makes you realize that, more often than not, you really shouldn’t judge a book by its cover. This is a truly compelling book and a thoroughly riveting read.